If your flat or sloping roof has a conventional felt covering and is 10 or more years old, then you have already been thinking of the inevitable WHEN IS IT GOING TO LEAK? This is not an easy prediction because of stones and moss covering the felt. Most of these old felt roofs contain a main ingredient of bitumen. These bitumen based products are in the same family as tar or pitch. Unfortunately this type of product has been used to varying degrees of success over the years, with a very unpredictable life span. Due to the elements breaking down old felt and the sun causing blistering or big air bubbles trapped under the felt. Also not to mention all the joins on each strip of felt. All this boils down to a very unstable roof covering. All old roofing materials are to be removed from roof area. This will allow a full examination of the roof timbers to check for wood rot. Plus the fall of the roof is to be checked to ensure correct drainage of roof plus insulation top up if necessary. 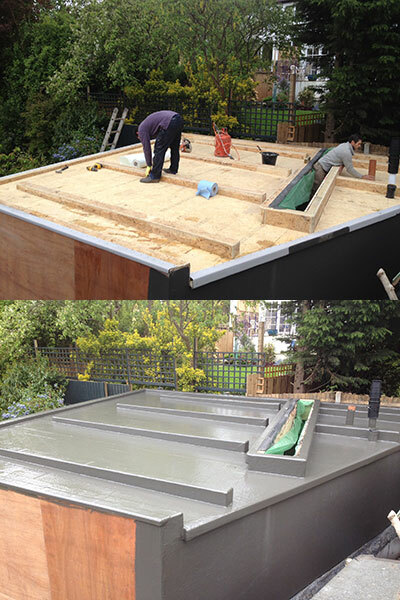 A new wooden 18mm exterior ply or sterling board decking is laid and all boards are to be screwed down, not nailed. UK Roofing fit and supply a high performance seamless flexible flat roofing system made entirely of GRP (Glass Re-inforced Polyester) laminate which is laid 'in-situ' directly on top of new external decking. This process consists of 4 different layers of polyester resins and re-inforcements which bond to timber decking indefinitely forming a seamless flexible watertight membrane which is finished by resin bonding a coloured gel coat finish. Now the roof is finished you have a smooth solid laminated surface with no joins, seams or welds whatsoever, covering the entire roof area which is maintenance free and tough enough to walk on or stand ladders for access for window cleaners. This system comes with a fully written 30 year guarantee for about the same price as a felt roof, with a 10 year guarantee. As you may already know, because of previous leaks you will get to find out when your old roof begins to leak. The problems are sometimes masked as a small leak might not show on your ceiling or wall for sometime. As the roofing timbers and insulation may be soaking in the water from a small leak this ends up with timber work getting wet, then dry, then wet again, ending in wet rot and damp spreading throughout the roof area. Then as your leak gets worse you hear the drip, drip or a wet patch on your ceiling appears. All this can be an extra burden to put right. So if your felt roof is 10 years old or more, these facts should be taken into consideration. You can contact UK Roofing, Weybridge Office for a no obligation, in depth survey and report on your flat roof. This will be followed by a fully written quotation. All this is absolutely FREE, so don't wait for a rainy day to remedy your flat roofing problems. Contact Us NOW! UK Roofing is not a franchise and none of our GRP roofing is contracted out to other companies. We provide a total service from start to finish for our clients.